Growing a small team is hard indeed. If you have just started your own company and are in search of people who can help you, we can surely give you some idea and help on that. Hiring indeed can be a challenge, especially if you are an entrepreneur who is trying to grow their company. For any small business, every new hire has a great influence and impact. 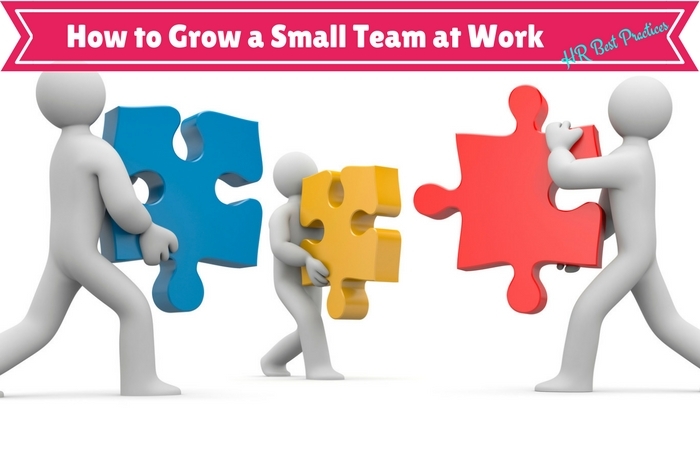 The stakes may be high but you need to make sure that all of the hires are passionate, committed and people who will stay in the game for long and for that very purpose, we have decided to get you some really quick tips and ideas on how you can grow yourself a small team. Keep reading to find out in the post below. First and foremost, you have to check out where and how you can find the perfect set of people for your company. You are looking for the best candidates and for that, you must know where these guys are hanging out. In case you are looking in a market for some technical talent, you can check any hackathon as a source of help. In case you are hoping to find someone in sales, you should show what a great place it is to find someone inside their element and also get an idea of how you want to deal with all the customers. Even though they could sound a little boring, conferences could be a fine way to find some talent so that you can get the best people for your business in the best ways possible. Time has changed a lot in recent years. People are busier now than ever, even when most of the people do multitasking. The business and the multitasking make working on the fixed hour a boring and heavy workload and lots of people do not want a baggage like a fix working time. A lot of people hate the idea of working in an office environment within 9 to 5. You must understand flexibility as something that works as a selling point. Experts have said that as long as your team members are meeting their goals and have all the collaboration that is needed whether it comes to fixing the right schedules or the office hours, all of this could really matter. Having a little bit of remote work everywhere could really help you have more happiness and retention. It will not hamper your productivity at all. Studies have shown that people who are happy with their job do more work than an unhappy employee. So to grow a small team provides your employees a flexible working hour schedule which is based on target and deadlines as well as has some discipline. A workplace where the employee doesn’t get appreciation and some kind of encouragement for the work they have done is, most likely to be an unhappy workplace and employees constantly try to switch jobs. The only way to grow a small team is to let them flourish with attention, encouragement, and care as well as give them chance to progress otherwise you can never have what you are aiming for. Yes, a lot of people do think that it is the job of a candidate to impress them but you should always remember that recruitment doesn’t work that well. If you want to grow a small team, you will have to impress them so that they feel that your company is the best move for them. Experts have once again said that they do take the process of recruitment very seriously. They understand that the candidates must be treated like they are valued otherwise they will want to leave fast. A cultural fit is also essential. You should let the people know who they are in your eyes and that they will be taken care of. Can you buy a car without checking and driving it? Will you trust someone and spend your hard earned money because someone saying something good about that car? Probably not then why should you hire employees without testing them first? Most recruiters make the mistake of hiring the candidate on the basis of academic records and years of experience but you can really check a candidate when they work. A test drive of a candidate will make you sure of your decision and you can easily eliminate the incompetent candidates. When a company starts to explore the business they usually do a lot of hiring which includes hiring newcomers and experienced candidate but it often happens that new recruitment does not give the result they were hoping for. A test drive is indeed essential. Yes, it could be very expensive to hire someone but it is even more expensive to replace another person. So once you have decided to commit towards both the parties, you should always check and test the contract. Experts say that taking candidates on a test drive is extremely helpful and helps the person to make sure whether they are good enough to make a long-term commitment in the future. Communication is the key to many issues and problems as well as the answer of some of the most complicated question because when you start talking, you uncover some of important fact and figure which usually hideaway. Communication within the organization is even more important as it shows how interested you are in the people who work for you and how your employee respond to you. There can be various medium to communicate but email communication have some of the amazing benefits. The one thing you should always remember to do is to make a good note of email communication. You should see how the candidates are expressing themselves and if they do follow up with the timelines or not. This does not just indicate the interest level in the same position but will also give you some insight into the whole style of communication. It is essential that such sort of communication fits your business, especially when the skill is hard to adjust in. Since we all know that startups compete with much more established companies who have the same candidates, we understand that you will feel the pressure to sell all candidates on the whole opportunity during the process of the interview, sometimes at the cost of becoming too candid about those challenges and some areas which need improvement about your company. However, this may result in some disappointment and dissatisfaction which is needed for the new hire as they feel like you have taken away information from them. This may seem like a great opportunity just to check how the candidates have reacted and given different parts of the solution. It is indeed essential that you involve several people who are needed in the process of making decisions, from screening the candidates and conducting the interviews to even getting involved in the interview decisions and conversations. You should try to get much more than one employee to get involved at every stage of the process. This could be perceived as the response of the candidates differently. Also, make sure to always remind your members that people who are new will share the same values of the company but that should never be the complete duplicate of all the existing members. This could seem a little obvious but you can get in touch with your other colleagues and bosses. Even if the candidate gives you some reference that will sing all of their praises, it is important to take some time and get the whole point in such a process. Remember to avoid asking stupid questions and never be stupid enough to ask all questions that are tough. Next, you should check for the cues, see the tone which is needed for expressing the areas which need improvement. In case you feel like they are being vague, you should try to let them see if they want to ask more questions. The employers who converse directly to the employees and convey the goals, dreams and vision have more satisfying results than the employers who keep their employees at the arm length. It is important for an employee to know that what they are working for and what is the ultimate goal of all this hard work. It may look like you are getting personal but it is important on so many levels. There could be some candidates who aren’t perfect but you have to decide to take away the leap of faith. You do need some more experience or get hold of a certain skill. If that is the case, you should remember to make an offer no matter how candid it is and how you would like to develop. It will set some expectations from the start and also give a few candidates the chance and the opportunity to step up to the challenge. Always remember that settling is the last thing you want to do when it comes to hiring. There is literally no reason why you cannot find the best candidate. It could take some leg work along with some tools but you will definitely find the person you are looking for with some little time. We are searching for A+ candidates at every level whether it is entry or even executive, always remember that they always bring some kind of wonderful talent. Before you start spending too much time in the hire, you should never underestimate the value of liking someone. You should search for people who come to work with you almost every day. Several experts have also said that their team always waits until they have found the perfect match or the perfect candidate that is needed for the job. They should be professional and have long term career goals at the same time. An aimless effort and aimless conversation are a waste of time, money and energy especially if it is the workplace. The people who set goals, make agendas and use strategy to work are the successful one. You cannot expect everything on the silver platter because if you are thinking that growing a small team is an easy task then you are delusional. When there are several team members who get involved in some process, set some agenda so that everyone happens to be clear on the schedule along with the roles of the individuals inside the process. You have to do this to make sure that there is some clarity, which will help you make the good decision and the best hire. It will also help you make the conversation productive and worthwhile. When you are building a team, you need to have the perfect mix of talent as well as the expertise which also takes enough energy and time, but it will definitely be worth it when you have met the right person who can handle the job. Finding the right person for your job is indeed hard and growing a team is also quite a task but you can certainly do that if you keep trying to make things happen. With that, we would like to bring the post to a close. If you have enjoyed reading the article and have some tips, suggestions, and feedback for us, do let us know in the comment box below. We would love to get back to you. On that note, good luck and don’t forget to keep trying. You will surely find what you want some day.